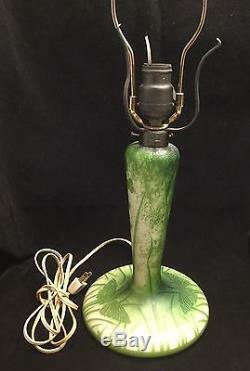 Gorgeous Nancto Green & White Cameo Glass Table Lamp. The cameo art glass lamp is decorated with butterflies and foliage. Marked on the base "Nancto". Overall 7" W x 21" Tall without shade. The item "Cameo Art Glass, Nancto, Table Lamp-Art Nouveau-Green & White-Butterflies. #130" is in sale since Monday, February 27, 2017. This item is in the category "Antiques\Decorative Arts\Lamps". The seller is "tomsuej" and is located in Glenside, Pennsylvania. This item can be shipped to United States.